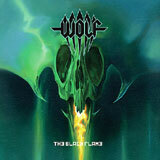 Sweden's Wolf are back with their fourth studio album, Black Flame. No modern influences such as down tuned guitars, distorted vocals, industrial sounds, or harsh vocals have infiltrated Wolf's sound thus far. Like their three previous albums, Wolf is waving the flag of classic heavy metal high and proud. While the guys haven't changed their sound a bit from their self titled debut, fans like myself continue to look forward to each and every release from this band. Wolf has found a sound that clearly works for them, and they serve it up in first rate fashion with each passing album. Wolf is playing classic, melodic heavy metal of yesteryear with tight and energetic fire. The Iron Maiden worship is a huge part of the band's sound, and I would go so far as to say that Wolf are currently playing classic Iron Maiden style music much better than Iron Maiden are doing it. I guess the students have a little lesson they'd like to teach the teacher? There's more to Wolf that just Iron Maiden influences. Wolf had done and continues to do a fabulous job of capturing the finest elements of classic heavy metal and rolling it into their own sound. Influences from bands such as Mercyful Fate, Accept, Saxon, and from the NWOBHM era can be heard in Wolf's sound. You'll be hard pressed to find a band these days playing this type of music as well as Wolf. Picking up right where Evil Star left off, The Black Flame continues the fat power chord and galloping riff laden guitar assault on your ears. I Will Kill Again leads off the album in strong form, much a sign of things to come. An infectious chorus line combined with the energetic guitar work and tight rhythm section make this the first of many metal anthems to be discovered on The Black Flame. Niklas Stålvind's lead vocals are a key ingredient to Wolf's sound. He has a high pitched voice that just soars through the songs without sounding thin or over the top like a lot of power metal band such as Power Quest tend to do. As a result, you can easily listen to this album time after time and the vocals will never grate on you. Extended solos and instrumental breaks are present in each of the songs, very much a nod back to the days of big and loud guitars. This element of Wolf's songwriting reminds me quite a lot of classic Maiden and their dazzling instrumental breaks that made an eight minute song fly by in no time at all. Songs like Black Magic and Make Friends With Your Nightmares are mid tempo metal anthems with the obligatory catchy chorus lines, but equally catchy and memorable guitar work. Early 80's Saxon comes to mind very quickly here, but you could also cite a Mercyful Fate influence on Make Friends With Your Nightmares with the shrieks that Stålvind wails out in the middle of the song. The Bite and Demon are amongst the songs that feature trademark Iron Maiden style galloping riffs, much in the vein of Number of the Beast or Piece of Mind. The Dead is a mild surprise from the band in terms of its heaviness and relative darkness. Although the classic vibe is still there, Stålvind's delivery is a bit more sinister, and the guitar work and intensity of the song take on a decidedly Painkiller vibe. As with any Wolf album, I'm hard pressed to name a weak song on the album. With that statement, I can only conclude that Wolf are masters of detail when it comes to composing each and every song on their albums. The guitar work simply never relents in terms of energy and creativity. Even during mid tempo songs such as Children of the Black Flame, the guitarists make a point of adding some adventurous and expected heavy riffs to the verses of the song. Well placed shreds, the aforementioned instrumental breaks, and dual solos round out the hearty menu of outstanding guitar work on this album. The rhythm section is ever so tight on this album, but more than just that. Mikael Goding's bass provides a solid bottom end to the sound, while new drummer Tobias Kellgren (Dissection, Soulreaper) colors the songs with a lot of unpredictable and extremely varied beats. Fans of old school heavy metal that are already familiar with Wolf can blindly buy this album. If you have yet to discover this band, try this album out. If you like it, you will almost certainly enjoy the entire discography of the band. Wolf have certainly found what they are good at, and have become a well oiled machine in terms of producing outstanding classic metal inspired albums.